I love this book! 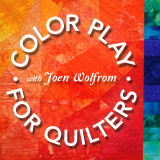 Color Play by Joen Wolfrom instantly rocketed to my top-five favorite quilting books of all time. Joen has taken all the hocus-pocus out of color selection and replaced it with a set of clear steps to follow. And she accompanies her explanations with wonderfully illustrative photographs. If you want to learn more about color, this is the way to learn. If you have trouble picking colors, this book gives you a step-by-step process that takes the stress out of color selection. If you want to expand your color usage by trying something different but don’t want to spend lots of time working on something you won’t like when it’s finished, start here. Joen Wolfrom’s Color Play is by far the best color teaching and color reference book for quilters on the market today. This incredible book is easy to understand and provides quilters with innovative and effortless ways to add knowledge to create their own colorful, charismatic quilts. A marvelous addition to every quilter’s library. I love color, and from the moment I opened Joen Wolfrom’s book I knew I was in for a treat. A book which will be referred to again and again, it deserves to be a best seller. This entry was posted by ckitchens. Bookmark the permalink.